The Webhook / HTTP channel makes an HTTP POST request to the specified URL, encapsulating the alert data in an XML string, JSON object, or Serialized-PHP array. This enables you to invoke a Remote Procedure Call (RPC) within your system, allowing applications to automatically take action when Wormly alerts are triggered. What's in the HTTP request? 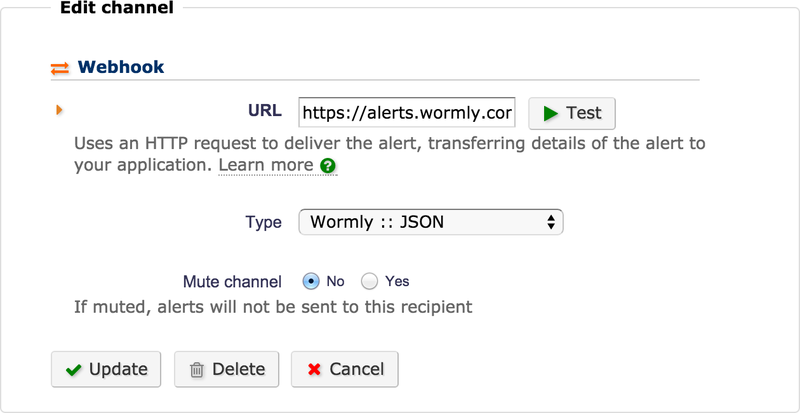 Wormly will make a single HTTP POST request to the specified URL, containing one POST variable: wormlyalert. Depending on the data format you have specified, this variable will contain either an XML string, a JSON object, or a serialized PHP array. What information is provided with the alert? A unique ID identifying the Wormly host from which the alert has been triggered. The customer-specified name of the Wormly host. 0 if this alert indicates a failure, 1 if the alert indicates that the host has recovered from a prior failure. The amount of time (in seconds) for which the host has been down. A unique ID identifying the current alert escalation level. The textual name describing the current alert escalation level. An array of the hosts' sensors which have failed their tests. The sensor type, e.g. HTTP, POP3, etc. A globally unique ID identifying this sensor. The error message indicating why this sensor failed the test. There are libraries available for most platforms to parse JSON objects into native data structures. See JSON.org for more details. Downtime Hurts. Start monitoring and stop worrying. Our monitoring service continually tests your servers & web sites to keep you online and performing fast. Fully-featured plans start from just $25 / month. Uptime Monitoring and Metrics to keep your apps online and performing - always.